When I began this column a little over a year ago, my goal was to trace how contemporary writers are thinking about climate change. That alone, I thought, was a worthy objective – I did not hope to find stories that could literally change minds. 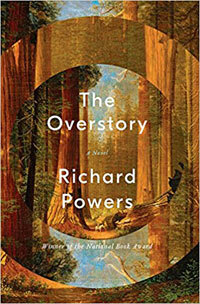 Then I read Richard Powers’s The Overstory, out last month from W. W. Norton & Company. Amy Brady: What inspired this gorgeous novel about the relationships between humans and nature? Richard Powers: I was teaching at Stanford and living in Palo Alto, in the heart of Silicon Valley. Just to one side of me was one of the greatest concentrations of wealth and technological might in history: the corporate HQs of Google, Apple, Intel, HP, Facebook, eBay, Cisco, Tesla, Oracle, Netflix, and so many more. To the other side were the Santa Cruz mountains, covered in redwoods. When the scramble for the future down in the valley was too much for me, I would head up to walk in the woods. These were the forests that had been clear-cut to build San Francisco, and it seemed to me that they had grown back wonderfully. But one day, I came across a single tree that had, for whatever reason, escaped the loggers. It was the width of a house, the length of a football field, and as old as Jesus or Caesar. Compared to the trees that had so impressed me, it was like Jupiter is to the Earth. Amy Brady: A good part of this book takes place during the timber wars of the 1990s. What are your thoughts on this moment in history? Can its legacy still be felt among activists and/or the logging industry? Richard Powers: The period from the late 1980s to the early 2000s was a remarkable and revolutionary moment. America woke up to the fact that 95 percent of its supposedly inexhaustible forests had been cut, and that the last five percent were slated to be felled. People who were not activists and who had never fought in public for anything were moved to put themselves in often violent situations to stand up for the rights of things that many others considered a God-given resource. The few remaining pockets of uncut forest in the Northwest are a testimony to this confrontation. Amy Brady: I was deeply moved by Nick’s story – his continuation of a project started by his grandfather, wherein every month he’d take a picture of a single tree. This story illustrates beautifully the idea that we can gain a wealth of knowledge about ourselves and nature by living on a single piece of land for a long length of time. Do you think Americans have lost anything by becoming more geographically mobile over the last century? Amy Brady: Your book suggests that connections between humans and the natural world become most visible only after decades, even centuries, have passed. I was struck by that suggestion, because it’s been said that climate change is the result of our species’ failure to see how our actions have affected the planet in our own individual time periods. It’s only after years of analysis that a pattern has begun to emerge. At a time when the effects of climate change have become more visible than ever, do you think we’re getting better at noticing – and hopefully understanding – the effects of our activity on Earth’s ecosystems? Richard Powers: We are phenomenally bad at experiencing, estimating, and conceiving of time. Our brains are shaped to pay attention to rapid movements against stable backgrounds, and we’re almost blind to the slower, broader background drift. The technologies that we have built to defeat time – writing and recording and photographing and filming – can impair our memory (as Socrates feared) and collapse us even more densely into what psychologists call the “specious present,” which seems to get shorter all the time. Plants’ memory and sense of time is utterly alien to us. It’s almost impossible for a person to wrap her head around the idea that there are bristlecone pines in the White Mountains of California that have been slowly dying since before humans invented writing. Amy Brady: Trees loom large in our collective popular imagination. They are frequently depicted as sentient beings in fantasy stories. Environmental activists are called “tree huggers.” In many books, movies, and songs, artists use trees to signify family roots and the passing of time. What is it about trees that continues to fascinate us? Amy Brady: Given scientists’ many dire predictions about the future of humanity in the face of climate change and various human-made environmental disasters, where was your mind set when you set out to write this book? Did you approach it from a place of hope? From despair? Richard Powers: I like Gramsci’s formulation: Pessimism of the intellect, optimism of the will. But the essential question, when talking of hope and despair, is: Hope or despair for what? Trees have survived cataclysmic changes in climate and several periods of mass extinction, and it’s a good bet that many will survive our current, man-made Holocene extinction. I’m very hopeful for trees. Richard Powers: Writing The Overstory quite literally changed my life, starting with where and how I live. Researching the book, I visited the Smokies, home to the largest tracts of remaining old growth forest east of the Rockies, with six kinds of forest and more species of trees than there are in all of Europe. I ended up staying, and I’ve lived for the last two years in this, one of the last refuges of biodiversity on the continent. Here, walking a trail has become as important to me as writing. The Overstory is my twelfth published novel. In the past, when I finished a book, I was always ready and excited to go on to a new topic – something new and different from anything I’d written about before. Now I just want to walk, look, listen, breathe, and write this same book, again and again, from different aspects and elevations, with characters as old and large as I am able to imagine. The Overstory by Richard Powers, W. W. Norton & Company, published April 3, 2018.